The second installment of the Alien franchise is the most successful of the bunch. 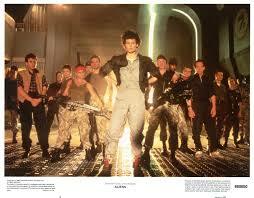 Aliens is a Sci-Fi, Action Horror film that had been written and directed by James Cameron. Produced by The Brandywine Corporation and distributed by 20th Century Fox. A direct follow-up to Alien, this sequel improves on the original in several ways including deeper world building, better acting, nail-biting action and most of all MORE Aliens! It also boasts an amazing cast that includes Sigourney Weaver, Michael Biehn, Paul Reiser, Lance Henriksen and Bill Paxton. It was made in 1986 and still holds up as the greatest of the franchise. Ripley is found 57 years after her first encounter with the Xenomorph on LV-426. She had been found in hyper-sleep, floating adrift, the only survivor of the USCSS Nostromo. The Weyland-Yutani Corporation had retrieved her. And, after a tense debriefing, Ripley is tapped to go back to LV-426, this time on a rescue mission to find survivors of a terraforming project that had begun after she escaped. Weyland had lost contact and are fearing the worst. Ripley isn’t going alone. This time she’s outfitted with a military detail. In 1983, Fox had been looking to pursue a sequel to Alien. The Brandywine Company had been high on Cameron’s work in The Terminator and asked him to write and direct. Fox was mildly supportive and provided a budget of $18 Million. Not much, but something that Cameron and his crew could work with. The filming had been tough. Plagued by the dreaded low-budget, it was filmed in the United Kingdom. The British crew had been difficult to work with. They were Ridley loyalists. Bitter that this young, American go-hard had taken their lord’s position of director. That made life hard for Cameron and the cast. But it was a hit. The film was popular and made $180 million worldwide. James Cameron’s work in this movie is outstanding. His attention to detail and ability to build a believable world is some of the best in Hollywood. For a low-budget feature, this presents itself as any big-budget blockbuster of the time. The quality is that good. Visually, the movie is near flawless. The effects are fantastic. The creatures were created at the famous Stan Winston Studio and the practical effects supervisor, John Richardson, had won an Oscar. Not too shabby. The Alien Queen is the coolest Xenomorph to date. Aliens is so badass. Sigourney Weaver returning as Ripley in her prime. She is much more of a warrior here, brandishing a giant gun and looking jacked. But the most memorable is Bill Paxton. His whiny “Game Over man” line is amazing. I also love the ship's resident synthetic, Bishop, played by Lance Henriksen. For some reason I liked seeing Paul Reiser too. His presence makes me nostalgic for Mad About You! In fact, the entire cast is money. My only gripe is with the sound mixing. Some scenes have barely audible dialog followed by excruciatingly loud gunfire. This is done to increase the suspense. But, I kinda hated it. Some scenes were so loud and sudden it made me flinch. During my research for this article I was surprised that the film was made on such a small budget. Hell, Borat was made on an $18 Million dollar budget. But Aliens didn’t feel cheap. That’s what set it apart. It has such a magnificent feel. Larger than life even. The gripping action mixed with overhanging dread drives the picture. Also the epicness cannot be missed. Whether you are a fan of this series or not, it's still watchable and enjoyable for everyone.